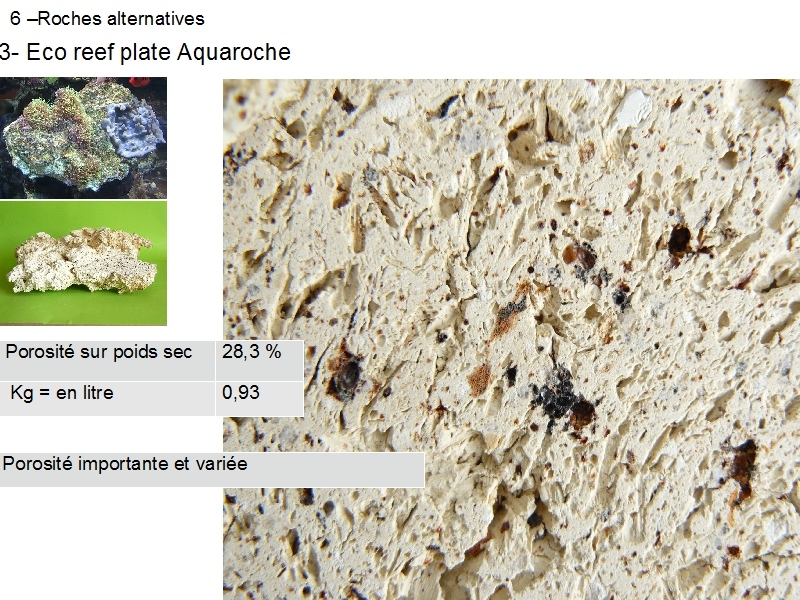 Eco reef plates- An alternative to wild live rocks. How many rocks for my reef tank? 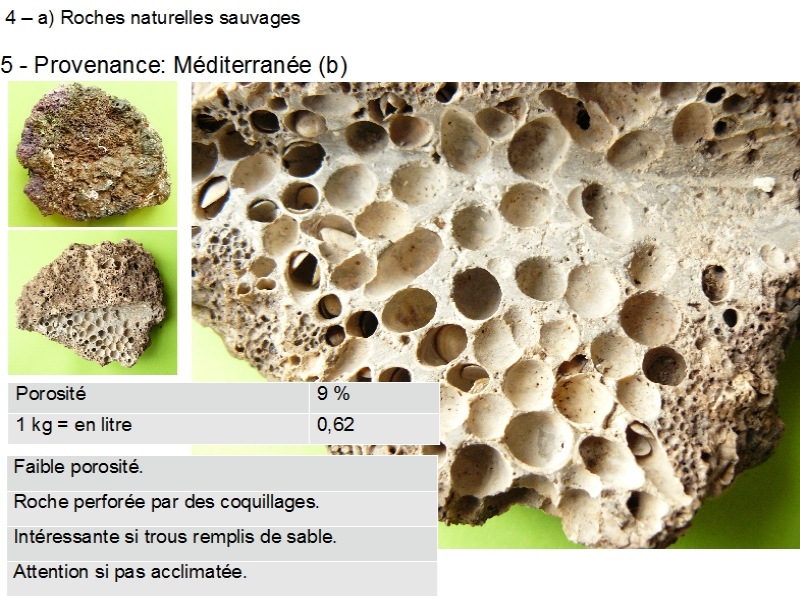 The ‘Club Languedocien d’Aquariophilie Marine’ (French marine association) organizes regularly exhibitions and conferences and asked us to show our different rocks and to explain differences and similarities with natural live rocks. 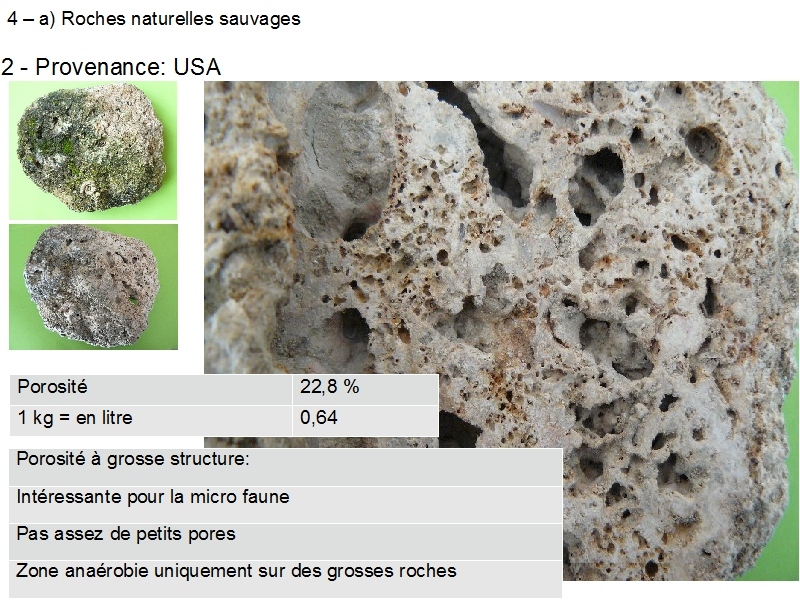 In 2007, we presented the first results: study of structures of rocks and live rocks, life support for bacteria and micro organisms. This statement was completed and presented as a conference, taking into account the role and the functioning of live rocks. This lecture was held in March in Montpellier Supagro with the Club Languedocien d’Aquariophilie Marine and in June: Congrès Récif France in Illkirch Grafenstaden. A written version has been published in ‘les Lettres Récifales’ n°69, in French and in German. the colonization of live rocks. 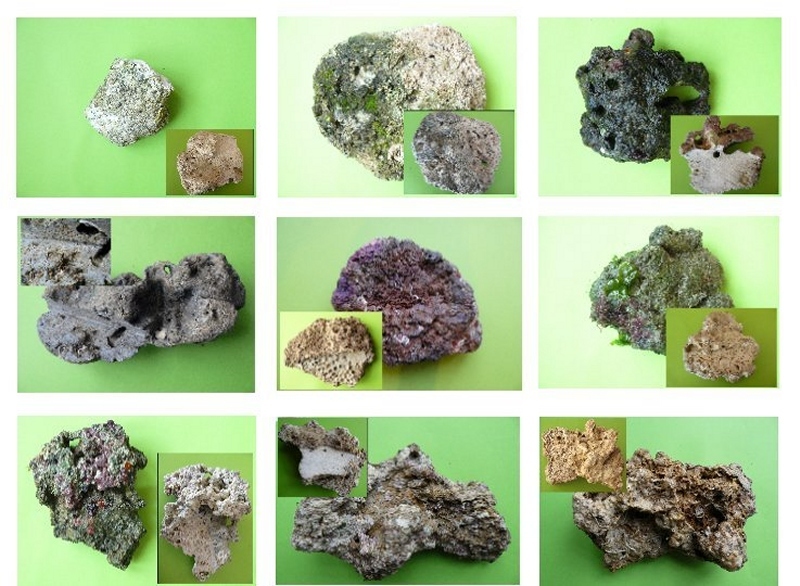 In our activity of producer of rocks and decors for reef aquariums, we tried to get precise information on porosity of live rocks; effectively, it is admitted that a good porosity is essential to make a good live rock. We only found information such as: light, very nice, covered with coralline algae or commercial arguments without any experimental justification except a long reef aquarium practice. 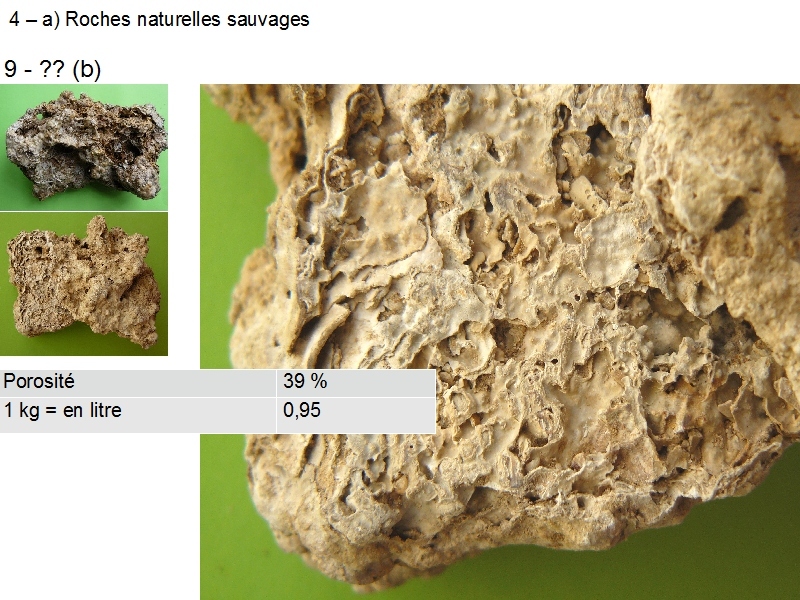 With the intention to go a bit further, we made tests on rocks of different origins. It’s important to make a short recall of what live rocks are, their formation and their role in the aquarium. 1- Formation of live rocks. 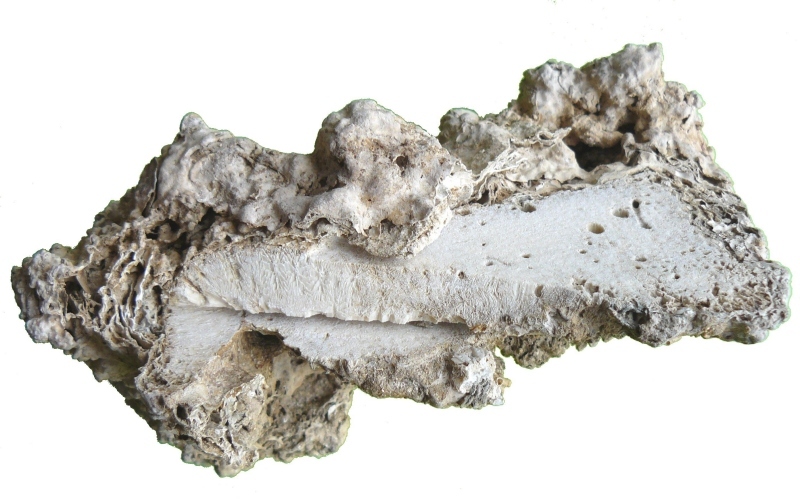 Rocks form in the oceans by accumulation of sediments, amalgams of fragments of corals or coats piled over years, of encrusting bodies, aragonite, calcite. Beside the porosity brought by each component, this agglomerate of heterogeneous fragments offers cavities and fissures between these different elements, where life can be sheltered. 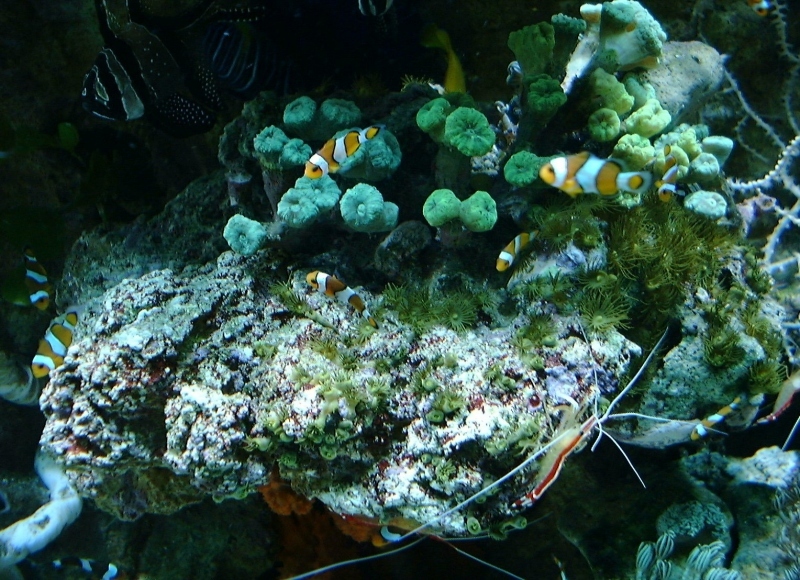 Live rocks are a major element of the ‘Berliner’ aquarium where rocks insure the filtration, together with a skimmer which limits the quantity of the wastes to be digested. What characterizes a live rock, if we compare to an ordinary rock, is the live part in the heart of the rock, which is possible thanks to the porosity where bacteria, seaweeds and micro-organisms can be sheltered. Bring diversity of live: algae, micro fauna and bacteria. That’s what is expected from good live rocks, but it’s not so obvious and we are trying to see why. 3 – How does a live rock work? a) Nitrogen cycle / Aerobic and anaerobic zones. Very simplified reminder: Nitrogen cycle is achieved by different bacteria families. In a first time, wastes are degraded in ammonia (very toxic), then in nitrites (toxic) and finally in nitrates (can be tolerated at a low rate, as some coral are very sensitive). The global structure of live rocks has to make the nitrogen cycle possible; for this, the structure of rock has to keep aerobic surface zones and peripheral coats (for degradation of the ammonia in nitrites and nitrates) and anaerobic zones in the heart of rock (for destruction of nitrates in gaseous nitrogen and carbon dioxide). A closed structure or with a very thin porosity will have a low rate of oxygen in the middle which creates anaerobic areas, propitious to reduction of nitrates. On the contrary, an open structure will bring oxygen inside the rock and won’t allow this nitrates reduction. b) Life shelter: importance of pores size. If you want a rock to harbour a great diversity of organisms, it is necessary to have places of different dimensions for each of them. Picture: Cut of a wild Indonesian live rock . Varied sizes and shapes of pores. Is there an ideal size of pores? For bacteria, in vertical stream filters (granular type), studies in water-treatment plants showed that a better result is obtained with thin particles with open pores (pores size of 50 to 100 micrometers (0,1 mm). 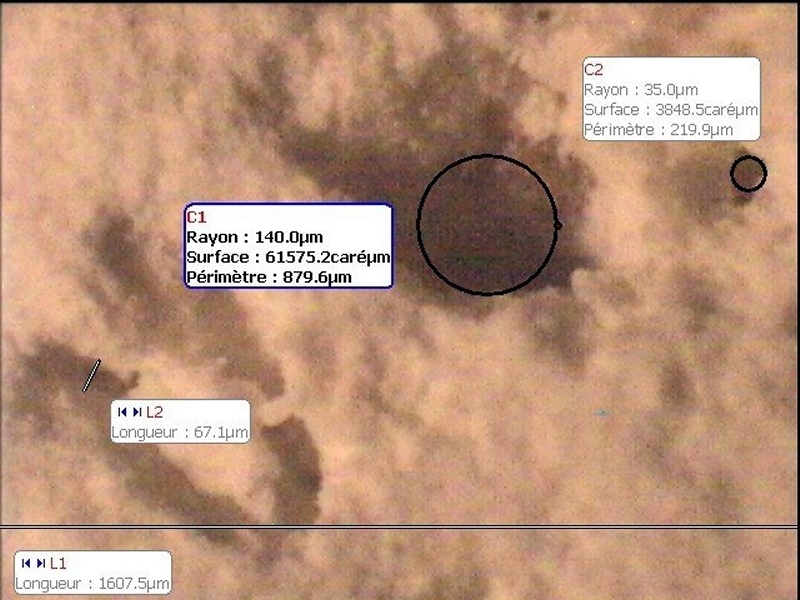 If this is true for very small granulates (a few millimetres), with a rock with a thickness of several centimetres, without an important net of fissures, exchanges are going to be difficult. For micro-organisms, over 100 micrometers (worms, copepods), we need a net of fissures penetrating to the heart of the rock, together with bigger cavities. A rock with a thin porosity will be efficient for the nitrogen cycle, but won’t be able to shelter an important micro-fauna. 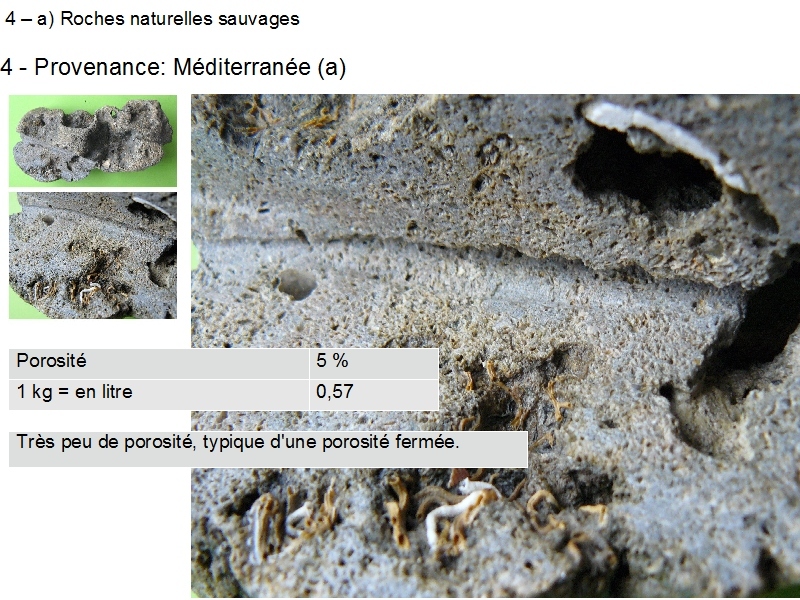 So, porosity of a live rock has to be very complex to answer the different and more or less opposite needs between reduction of nitrates and shelter for the micro fauna. c) Importance of bio films and role of worms. 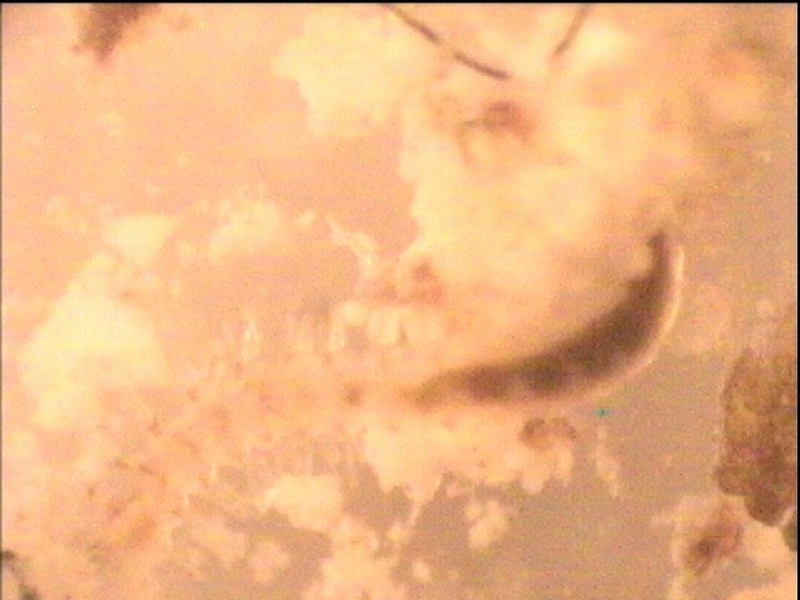 On photo we can see a worm (x 40 enlargement). It is 2 mm long and has a 0,1 mm (100µm) diameter. Bio films are viscous wombs secreted by bacteria, (exopolysaccharides / eps); they are a medium where bacteria agglomerate in colonies and where they can be exchanged and protected. These bio films can have a thickness of 60 µm to 1 mm. They play a fundamental role in medicine, treatment of material, nautical industry, water treatment, where they often make problems: beginning of corrosion, clogging up. In the case of a live rock, one can wonder about the risk of clogging up of the porosity inside the rocks, when pores are very small and regular (about 40 to 60 µm). Worms and micro-organisms have an important role to play to avoid this clogging up. Some worms feed on the bio film and circulate in the heart of the rock. By a phenomenon of contraction, they insure a pumping of the water in their cavities and make exchanges of nutriments and oxygen possible between the different parts of the rock and the aquarium water. A rock with a thin and regular porosity can’t be correctly irrigated by worms. The bio film, secreted by bacteria will tend to clop up the pores, because of its own viscosity and also by an acceleration of the phenomenon of calcium precipitation. The rock will be less efficient and the aquarium will meet problems after a few months or years. Some reef keepers change regularly some rocks and replace them by new live rocks or inert porous rocks, which helps to maintain filtration capacities. 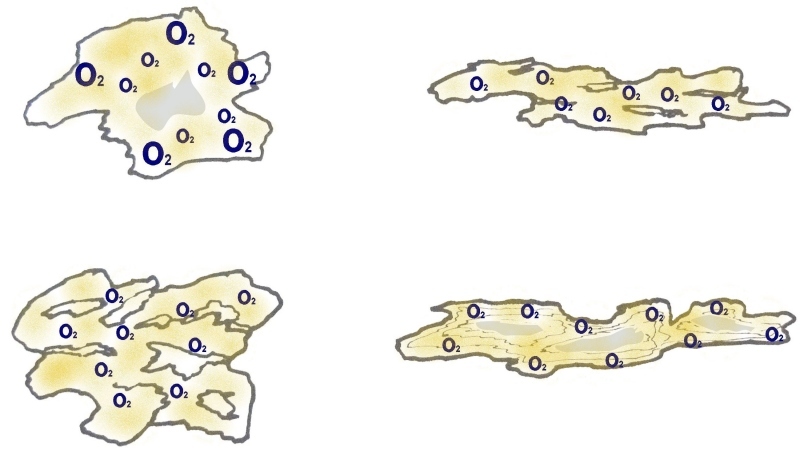 4 – COMPARISON OF STRUCTURE OF LIVE ROCKS FROM DIFFERENT ORIGINS. We studied porosity and density of a selection of different rocks. 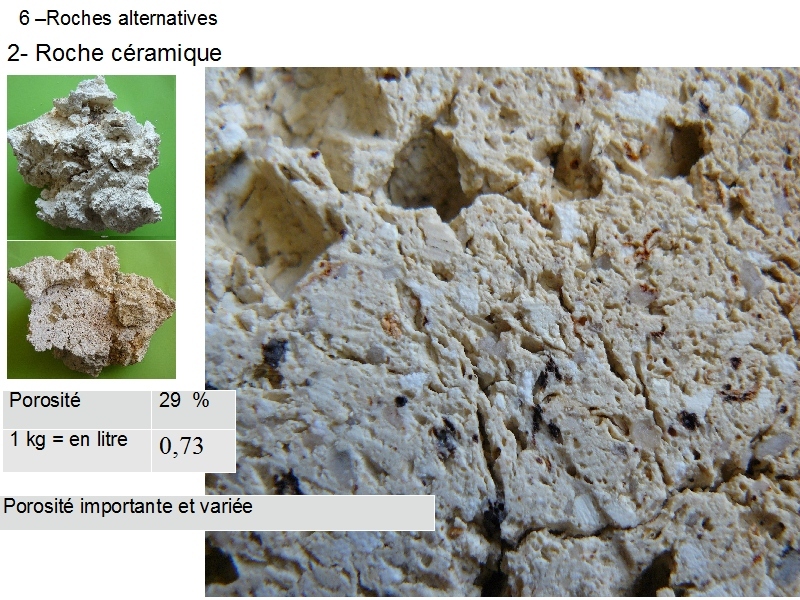 As these are natural materials, results are only valid for the tested rocks. Even in the same delivery, rocks can be very different. Commentaries are based upon previously explained criterions: efficiency for nitrogen cycle, life shelter and decor. We made same experiences with our rocks, which are produced in a regular way. Here is the comparison method and anyone will be able to make same experiences and measures on his live rocks and/or our rocks. measure of volume (rock in a very thin plastic bag, immerged: measure of water level difference). drying and then weighing of dry rock. calculation of percentage of porosity (arbitrarily : weight of absorbed water / weight of dry rock). Water retained by the rock is equivalent to the water retained in the smallest pores (<100µ). 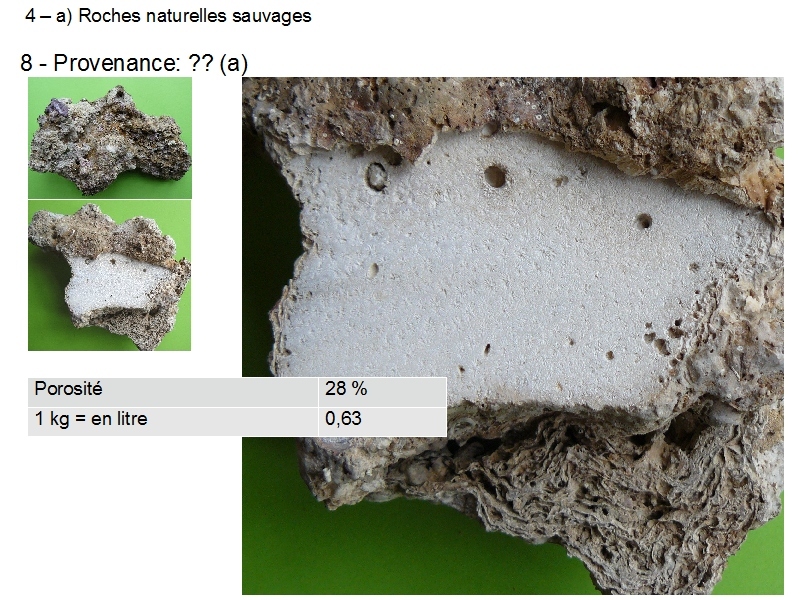 This is what’s interesting to fix bacteria and represents the potential purifying capacity of the rock. density / dry : 1 litre of rock weights x kilo. volume of 1 kilo of wet rock: enables price comparison (rocks are sold by kilo but a dense rock, even cheap, can be more expensive than a light rock (even if it is 30 % more expensive by kilo). Then we made a transversal cut, to see the porosity inside the rocks. Rock with very low porosity. Regular and too small pores. No possibility of penetration and exchanges. Porosity with big structure, interesting for the micro fauna. Not enough small pores, anaerobic area possible only with big rocks. One of the best porosity in % but too thin and regular. No exchanges between the heart and the surface. Very low porosity, typical closed porosity. Low porosity. Holes made by shells. Interesting only if holes are full of sand. Take care if not acclimated. Equilibrated porosity with good repartition of big and thin pores. 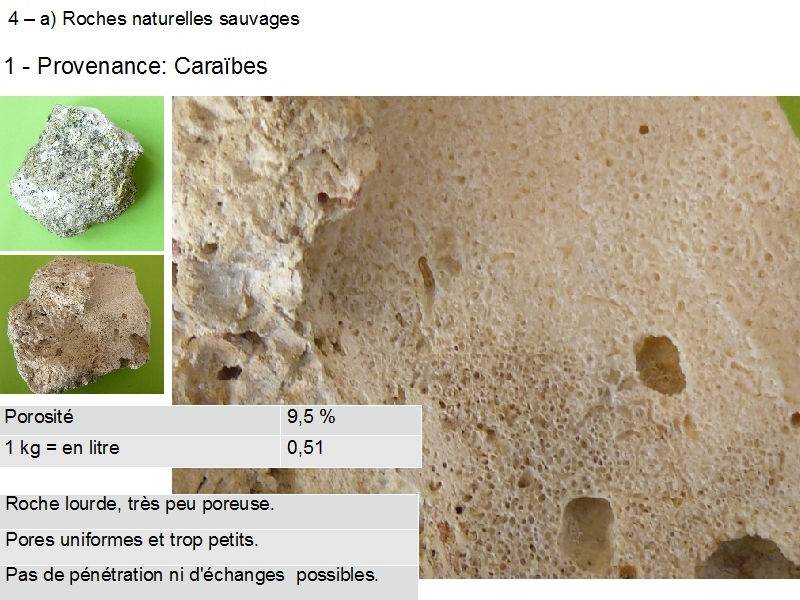 Very nice looking, but repartition a bit less interesting than on rock N°6. Large and thin pores. Extremely porous rock with laminated structure. Very interesting but rare and breakable. (rare: 1 kg of rock with this structure among 250 kg). A good live rock is the one with the best capacity to shelter life with an adapted porosity. It’s a bit like a lottery, so, one can reduce the risks and make an arrangement with rocks from different origins, with some big thick rocks and some flat rocks. others for their decorative or practical aspect (3). for the decor (3) (high and stable, decorative and easy to set up) (3). 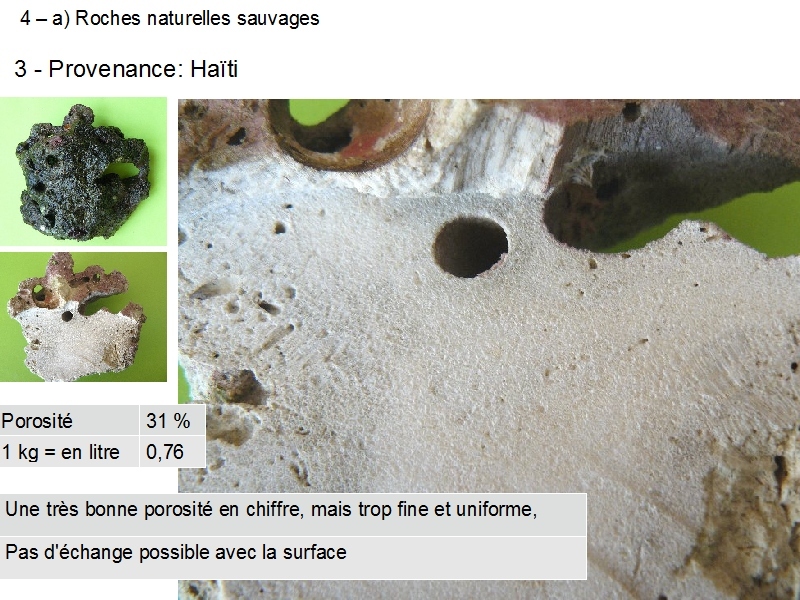 Many reef keepers think that coralline algae are the main element proving quality of a live rock. But this tells nothing about the internal structure of the rock. Note that an excess of encrusting algae will clog up the pores and stop exchanges. In this case, only the part underneath the rock will keep the filtration capacity. 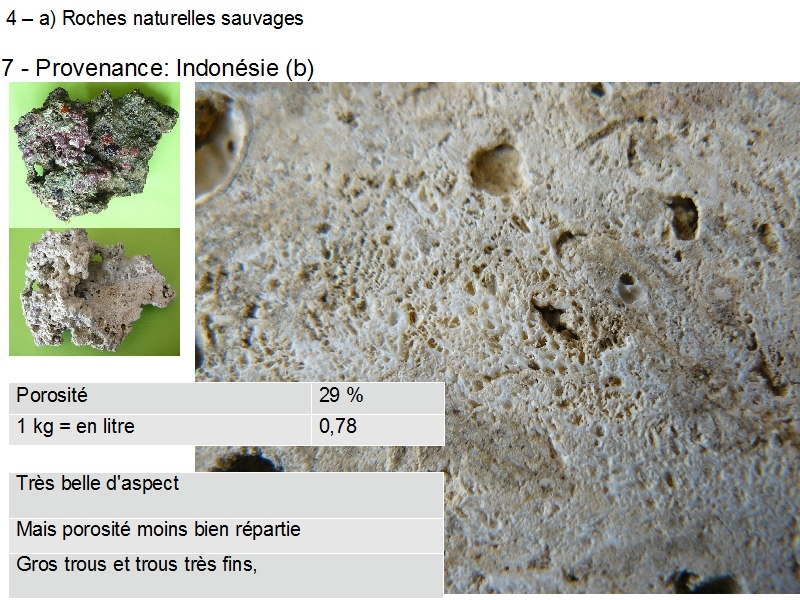 6-1 Artificial live rock: cultivated in Indonesia. Amalgam of coral pieces linked with cement. 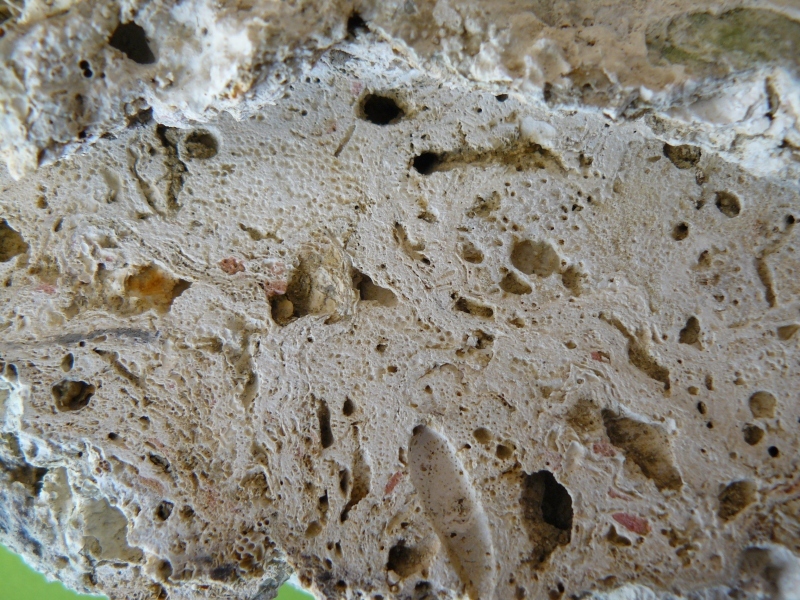 Porosity limited to the structure of the granulates, with difficult exchanges. Net of fissures and cavities unto the heart of the rock. Very good neutrality and solidity. Important and varied porosity, oriented in the length. Surface a bit more closed to grant an anaerobic action in the heart. 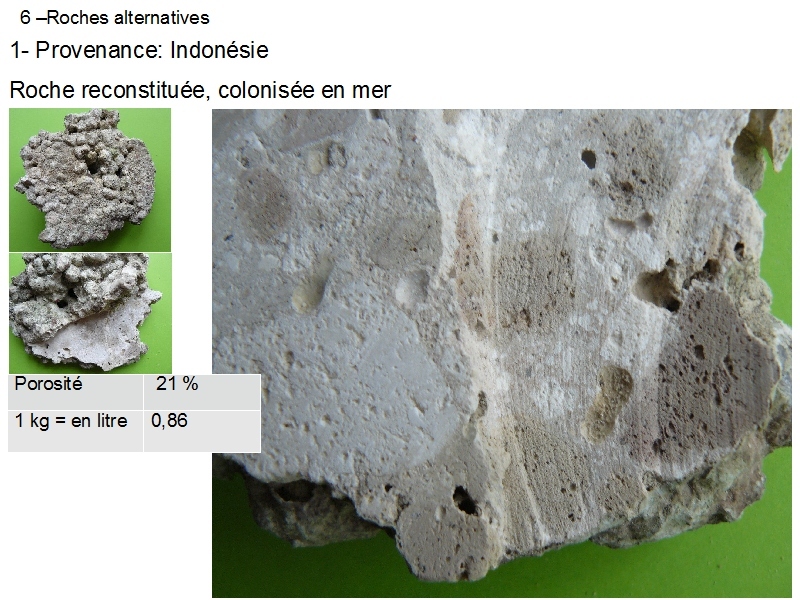 Comparison : wild Indonesian wild rocks and aquaroche ceramic rocks and eco reef plates. 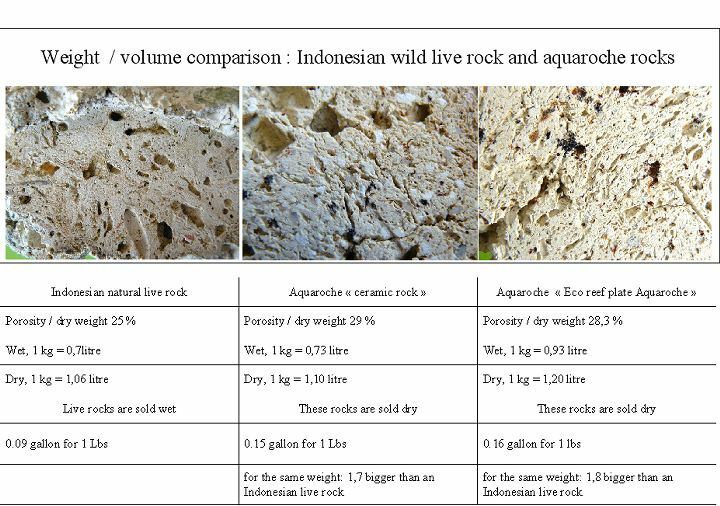 To make a comparison between wet wild rocks and dry aquaroche rocks, use this table with ratio weight/volume. 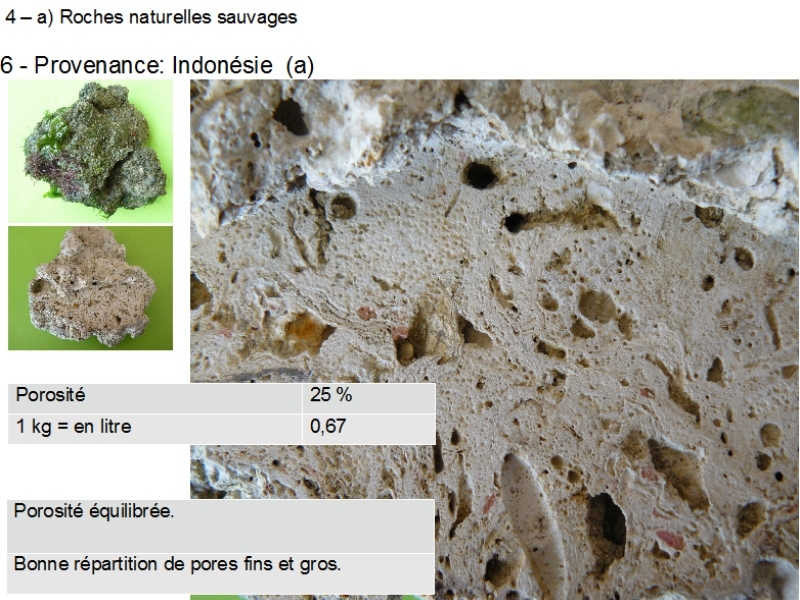 In the case of a decor built with dry new aquaroche rocks, these rocks are 50 to 80 % more voluminous than the equivalent quantity in weight of Indonesian live rocks (example: 1 kg of Indonesian live rocks = 0,67 litres and 1 kg of aquaroche eco reef plate =1,20 litres).